After a wide search, EYMS selected GreenRoad. 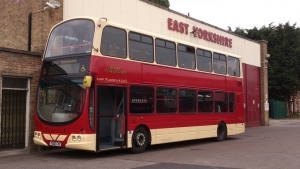 EYMS initially implemented GreenRoad at its Elloughton depot and then rolled it out across the fleet. In addition, EYMS developed communications, education and policies to support driver behaviour change. Its hundreds of drivers all received SAFED (Safe and FuelEfficient Driving) training. “When a new driver joins the team, they spend three weeks in training to teach them how to drive well. But most importantly they are given a GreenRoad account on day one,” said Heptinstall. GreenRoad’s solution alerts drivers when they depart from safe, smooth driving style, enabling them to immediately modify their driving behaviour and encouraging them to take charge of their own improvement and take pride in their achievements. In effect they have a ‘vocal coach’ in the cab.